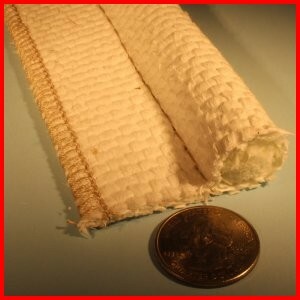 This high temperature and heat resistant tadpole tape is made from Tuff-Flex™ 550 Fabric tacky cloth. This is a widely used tadpole tape that provides a resilient and non-absorbent gasket material for service against steam, air, water and gases. Especially useful where a rough or uneven surface or flange exists. The fabric is a fiberglass base with a special white rubber formulation. The fabric is tacky, and has a plastic film surface covering that is removed before installation. The fabric will stick to itself once the film is removed. Wire Inserted Version: The fill (widthwise) yarn for this version of the fabric has a twisted brass wired formed with it, providing additional strength and electrical conductivity/shielding. 550°F / 287°C continuous rating, excellent sealing properties as a gasket material.